Worst. Loss. Ever. Or at least for this season. Yes, I think tonight is the worst loss of the year. More horrible than Tuesday's A.J. Burnett debacle. More gruesome than Wednesday's Chien-Ming Wang implosion. More nauseating than even that 22-4 loss (with the 14-run inning) in April. You expect to win a game when you finally have an ace who shuts down the other team. While I think CC Sabathia should have exited the game after the Dustin Pedroia walk, I'm not going to kill him - or Joe Girardi - for that. Even with that, CC pitched very, very well - one run through the first seven innings. He should have gotten the win. And no, I don't think having Mariano Rivera get six outs would have been the answer. Alex Rodriguez, who has been in a horrendous slump, gets a huge, clutch double to give the Yankees the lead. It seemed like a hit we would see as Yankees Classic moment. Unfortunately, it didn't quite work out that way. It's one thing to get shut out by Josh Beckett. It's another thing to get shut out by Brad Penny. (And what is it with the Yankees and the 2003 Florida Marlins pitchers, anyway? They're helpless against Beckett, Penny, and Carl Bleeping Pavano. And the one Marlin the Yanks have, A.J. Burnett, can't get the Sox out. Go figure. A-Rod's hit was the only hit the Yankees had with runners in scoring position the entire night. Unacceptable. Mark Teixeira made a reference after Wednesday's game about how the Sox were doing the little things the Yankees weren't. Like not making dopey baserunning moves, the way Nick Swisher did for the second night in a row. Or like catching fly balls, the way Johnny Damon didn't do. What was all that about David Ortiz having a lousy year? All he needed was Yankee pitching to put him back in the groove! Good grief. A-Rod gets plunked in the first inning, and the Yankees aren't able to retaliate, thanks to the umpire's warning. Typical. Need I mention the fact that the Yankees are 0-8 against the Red Sox? The mind boggles at that number. Like many Met fans, Squawker Jon is a Jets fan. There's an expression fans of Gang Green use about their team when they falter: Same Old Jets. 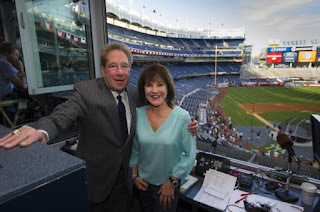 Sadly, even though the Yanks had been the best team in baseball for the past month, when it comes to the Boston Red Sox, they're the Same Old Yankees. Is this the worst loss of the year? Leave us a comment! i'm not sure NYY has a lot to complain about in the hit batter department. check the stats this year. seriously. It was absolutely the worst loss of the year mainly because it's a loss that defines both teams. It shows us that the Yanks-Red Sox rivalry is now a complete 180 from 2004. Ever since the ALCS, the Red Sox have been the better team and the Yanks have officially become the nail to their hammer. All that's left is for the Yanks to sign Pedro Martinez just so he can call the Red Sox his daddy's. The Yankees are a disaster! 1.Joe Girardi either mismanages or micro manages them into losses. Example:Starting Wang in Fenway, giving A.J. an extra day's rest (and then using that as a reason for his not having his command). 2. the lack of clutch hitting with runners in scoring position. 4.Not having a truly effective 8th inning reliever. (Move Jobo back to the pen. 4.Poor defense in the outfield. 5.Playing like they are intimidated by the Sox in all 8 games! What if we didn't give these Red Sox losses so much power? Doesn't that only make it worse? What if, like George Costanza-- we did the opposite of angst filled hand wringing? The more it gets mentioned as a special kind of series, the more the Yankees are elevating the Red Sox' abilities on the field and at the plate. Why help add to their mystique? I hate the losses too. For all the reasons you've written (in agonizing detail). But we're 2 out (despite it) and it's June. I think we'd "get in their heads," if we'd at least stop talking like they must have special superpowers. As I have said previously...even if the Sox beat us all 18 games as long as we win the division ...so be it. Do I like losing to the Sox? Hell no but if we can beat up on everyone else I'll take it. The fact of the matter is that there are still 10 more games to play against the Sox in August and September..why not wait to see what happens before people declare the season over .. Losing all 8 to out biggest rivals but still only 2 out in June..that's not too bad at all especially the way we started the season in April at one point we were 6 1/2 games out. Pete's entry was "sarcasm"...it does say it all but it's for the bridge jumpers especially with 102 games left to play.. I'd rather be an optimist than a pessimist...makes for a much healthier and happier life .. It was definitely the worst loss. It killed me to waste that performance by CC. And A-Rod did get a clutch hit for a change. But the other blunders were all on us, not the Sox. We're still only 2 games out of first, so it's not panic time. But we need to get it together against the Mets. To borrow a phrase from the musical Camelot, for one brief shining moment... a moment that lasted a month, a very nice month, it was possible to believe that the 2009 Yankees were less like the 2008 Yankees and more like the 1998 Yankees, a team that didn't care how good their opponents were, they just won anyway. And that this would continue against the Boston Red Sox in the three-game series now concluded at Fenway Park. It was possible to believe that this would be, if not 2000, or even the last Pennant season of 2003, then at least 2006. Talk about a fleeting moment: The Yanks were awful for the first three months, then took off, and in August swept a rain-forced five-game series at Fenway. For a fleeting moment, I thought that we might be back to that level, going into this Yanks-Sox series at Fenway. Then the series happened. This is unacceptable. The Yankees have let the Red Sox back into their heads. The Yankees are reeling, back out of first place, and looking like there's no way they'll ever be able to beat the Red Sox again. As Keith said, this last game was a season-defining, teams-defining game, unless the Yanks can somehow snap out of it. They're now 2 games behind the Sox. The Mets, 4 games behind the Phils. Each New York team might as well be 12 games out. This might be the most meaningless Yanks-Mets game since they used to have the Mayor's Trophy. Peggy, timing is everything, isn't it? I told my Brooklyn friend he jinxed the Yankees with his prediction. He got the score right with the wrong result. I will tell him no more predictions just for you! Geno is on Feinsand's blog claiming some sort of victory for the Rays since they are only 4 games behind the Yankees. It's more than I can tolerate. I love the Kitty picture. Priceless. 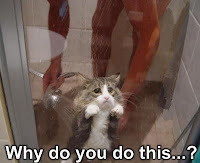 One of my psycho cats loves the shower! Have a good weekend all. The Sox are in Philly. Ugh! Lisa I think you are overeacting a bit to say "Worse. Loss. Ever." NOTHING I REPEAT NOTHING will get rid of the bitter memory of losing 3 in a row including GAME 7 AT HOME in the 2004 ALCS. Period end of story. WE all are very annoyed that they've lost 8 in a row to the Red Sox but frankly, right now the Sawx have better pitching (starting and relieving)than the Yankees. Girardi overmanaging? Well who the heck was he going to bring in the 8th? Veras? Robertson? Aceves had been pitching well so he took a chance with him and it didn't work. oh well maybe if he dind't have to pitch the other night when Wang blew up maybe he could have done better; that's not his role anyway. Wang clearly doesn't have his act together and now because of that panic move by management to recall him from AAA when Joba got plunked on the kneee they have No more options to send Wang back. I'd give Wang 2 more starts (one coming against the awful Nationals on Wed) if he doesn't have a quality start(meaning 6 innings or more)then he goes back to the bullpen and Hughes replaces him end of story. Poster #4 is correct in saying that poor defense(by Swisher,Damon and Gardner) and poor baserunning by Swisher 2 nights in a row probably cost them good chances to win the series. Can't wait to hear about the next Kangaroo Court; he should pay fines for himself and everybody else on that day LOL! Burnett better not throw another whipped cream pie in someones face for the rest of the year; that performance on Tuesday night was just horrible, extra rest or not. But despite all of that as everyones says we are only 2 games out of first place. Our eyes should be on the prize:1) get into the playoffs 2) get deep into the playoffs and 3) make it to the world series. Frankly, if our Yankees go 0-19 to the Sawx this year but make the playoffs and win it all; nobody is going to cry about that. One last thing, I don't envy Joe in the least but somehow someway he's got to get that kid Cervelli behind the plate more often.He is better than Posada defensively, and while Jorge can hit with power he's a liability on the bases; he's really more suited for a DH role especially since he is a switch hitter. Question is what do you do with Matsui? well he becomes a part-time player/pinch hitter. Why? Because its a LONG SEASON. PS. Our shut down 8th inning guy? His name is Joba Chamberlain. Girardi speak with forked tongue, he as more spin than RNC. Looks like his head is going to explode in the dugout. This team looks like another 3rd place finish and we will here all the excuses, players on dl, bad breaks, yada, yada, and wheres my paycheck! She reversed jinxed the Big Stinkee and the Red Sux. He has started to smash home runs again. All it took was Lisa's sympathy and caring. Then again, maybe he is again using steroids or at least the nut creame. I understand though... I cry a million tears for the Red Sux too. Face it: The Stankees also stink this year. Even if they get into the Playoffs, they could not be expected to go all the way. Anonymous says to the effect that things are actually "OK,... we are only 2 out." Yes, 2 out but if we had just split those 8 games, we would be 2 UP. A game in April counts the same as a game in September. You are a fool if you think otherwise. Red Sux usually means it's time to grow up .. I guess the word Young in your name says it all ..
Mrs. Uncle Mike, er, I mean Peggy - keep at it since you've got the right idea. I can't say I'd be as positive as you if the situation were reveresed, but I probably wouldn't be as negative as some here either. When the Sox got swept in that five game nightmare in 06 not only was it getting late, but it was indicative of how they were playing so although not eliminated officially, I knew the season was over. Its still June, the Yankees have been a second half team for years now (except that you're starting from a much stronger point this year), and you're only 2 back. One run games can go either way - its not like you got blown out (Tuesday aside). Two of three were well fought battles. Even though the Sox were already 7-0 this year I still got all cranky when ARod (my least favorite Yankee) put you guys ahead. I never thought they'd get anything off CC. So I can appreciate how fired up we all get when these two meet. Was this the worst loss of the season thus far for you? I'd think so if I was a Yankee fan. Is this the end? No. Lisa - I think I'm going to give up on predictions...I didn't think Ortiz would go deep once, much less twice and if you told me that Penny would go six scoreless I'd have said you were on something. Anything really can happen in baseball. So you get the Mets at home and we get to watch Dice K pitch at CBP. Right. (No offense Jon but the Mets aren't at their best now). Let's all revisit this on Monday. Hopefully we'll have seen the sun by then. Since Yankees fans are feeling a bit depressed right now given their 0-8 record against the Red Sox, I thought it would be a good time to "pile on" and add to their misery! For those Yankees fans that keep mentioning "we're only 2 games out", here's a few stats to think about. The Yankees played well in May, especially during that 9-game win streak. But they have been a .500 team since that streak and their schedule looks tougher to me than the Red Sox schedule given the 3 remaining West coast road trips. Plus their record against teams over .500 is nothing special. Keep in mind the Yankees have 45 games left against AL East teams, most against teams with winning records. Anything can happen but the Yankees have a tougher path and their pitching is not a good as the Red Sox. I keep trying to convince my Yankee friends that there really are NICE Red Sox fans...like you and Nam. I'll have to sit them down and make them read some of these posts... :o). If we were 10 games out at this point maybe I wouldn't be as positive but it's just 2 and that makes a big difference. The fact that we play the final 7 of the 10 games against the Sox at our house helps too. Who knows how these teams will look after July when trades could have been made or if any injuries occur (hopefully not...no injuries wished on any player). It's still very EARLY and as you said the Yankees usually do come on stronger in the 2nd half ..I'm just hoping that is the case this year too especially since they have had a much better start than in recent past years. It's baseball..a long season...anything can happen. I'm just going to sit back ..enjoy the ride and no matter what my team does ..I'll love 'em nonetheless. The schedule is the schedule ..if you are good you beat whichever team you have to face..if you don't ..you don't deserve to win. So Fred...you aren't piling anything on because I expect the team to win whichever team they play...even quite a few of the games left with the Red Sox in the 2nd half in our house. See you in August ..till then ...Go Yankees !!! I just wrote a post referencing some of the earlier comments in the thread. Check it out on the main Squawkers page. Thanks to everyone for responding. And Fred, I got no problem with the gloating. It is to be expected. Don't get me wrong - I'm still angry about the Yanks losing those eight games. And unfortunately, they don't to take them out. But between their nine-game winning streak and the Sox, they did go 10-6. As for the West Coast issue, if I remember correctly, didn't the Sox have a much better schedule than the Yanks did in the last two months of 2006? It didn't seem to matter very much then. Thanks for the heads-up on Geno, NAM. Considering him pasted. You're welcome Mike. Let's hope Geno is too stupid to find his way on to this blog. Peggy - I hear ya! I have friends that don't necessarily acknowledge that Yankee fans are human at all, much less nice!